We are a friendly practice located near the Norfolk Broads offering services to over 9,000 permanent residents, and the many people that come to the central Broads area during the summer months. We are a teaching practice and offer training for Registrars and Medical Students and are also registered to undertake research activities. We have a satellite surgery located once a week in Salhouse so we can provide a better service to our patients. If you want to check your test results then log-on to our On-line Services and click on 'Access the Appointment System'. Then, 'View Test Results' is a menu item under 'Your Record'. We are delighted to report that Dr Fowler has begun her phased return to work. Dr Reid and other locums will be providing patient consultations to the patients of Dr Fowler during her return. Following consultation with patients we will be offering more clinic time in the early mornings from 3rd April 2018. Please note that Dispensary will not be open at these times. We are open for pre-booked appointments each Wednesday evening (6.30 to 8pm) and one weekend in four starting 22 March (Friday evening and Saturday/Sunday mornings, 9am to midday). Other surgeries in North Norfolk provide the Hub service at other times - see below for further details. Extended access evening and weekend appointments are now available in North Norfolk. Urgent (same day) and routine (booked in advance) appointments with a GP, Nurse Practitioner or Nurse are offered to patients registered with a GP Practice in North Norfolk. Currently this type of appointment is available at Primary Care Hub sites at Cromer, Fakenham, Hoveton & Wroxham and North Walsham (Birchwood) Surgeries. Any patient, registered at any North Norfolk GP Surgery can access these appointments at these locations. 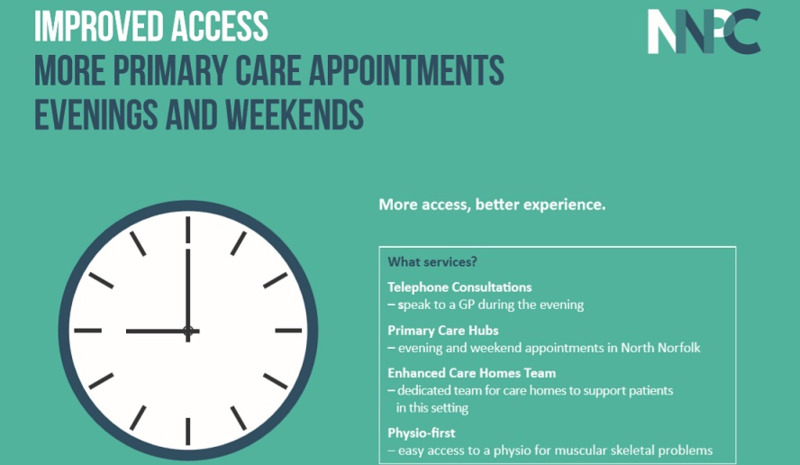 You can book an appointment at a Primary Care Hub by contacting your own GP Practice. The opening hours are 6:30pm - 8pm weekdays and 9am-12pm weekends. Please note that this is not a walk-in or emergency service, appointments must be booked via telephone prior to arrival. Our dedicated team are here to treat those minor ailments that occur as well as providing specialist management of long-term conditions and clinics covering a wide range of healthcare issues. The technology also means you can now do a lot of things from the comfort of your home such as order a repeat prescription or book and cancel an appointment. We also offer a travel clinic and offer a number of private practitioners. We are accepting new patients to the practice so please check our coverage map in the new patients section to find out more. We are also able to deal with minor injuries such as grazes, cuts, falls that need dressings applied. We also have an on site dispensary for patients to collect their medication from and provides a highly valued service for those patients entitled to use it (depending on how far you live from the surgery - feel free to ask). This also helps to fund a much greater range of services than the surgery could otherwise provide. The surgery also provide free NHS Health Checks to patients aged between 40-74. These are available to those who do not have a long term health condition and involves a blood test to screen for certain conditions, and other lifestyle advice. If you are interested then please give us a call to arrange an appointment. We can also offer smoking cessation advice and support to current smokers.